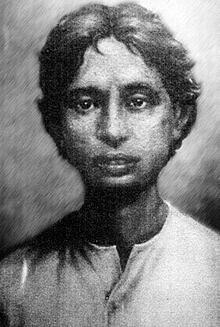 Khudiram Bose (December 3, 1889 – August 11, 1908) was a Bengali revolutionary and one of the youngest revolutionaries early in the Indian independence movement. He was born on 3rd December 1889 Bahuvaini in Medinipur district, West Bengal (India).His father Trailokyanath Bose and mother Lakshmipriya Devi. Khudiram Bose was inspired by the cry of Vande Mataram which became very famous after the novel Anandamath by Bankim Chandra Chattopadhyay. He started taking active part in Swadeshi movement and worked actively in the protest movement against the partition of Bengal in 1905 by Lord Curzon, the Governor General of India. Khudiram Bose joined a secret extremist outfit called Yugantar which formed by Aurobindo Ghosh, Barin Ghosh and Raja Subodh Mallik together. 30th April, 1908 in Muzzafarpur, Bihar Khudiram Bose and Prafulla Chaki planned to assassinate the Chief Presidency Magistrate Kingsford. The magistrate was known for his blatant judgments against the freedom fighters. They waited for Kingsford’s carriage to come in front of the gate of European Club and blew up a carriage but which was not carrying Kingsford. As a result of this unfortunate incident two British ladies – Mrs. Kennedy and her daughter were killed. Khudiram was arrested on 1 st May 1908, Prafulla evaded arrest by shooting himself Khudiram was tried and was sentenced to be hanged to death. On 11 th August 1908. Like a true lover of his motherland and a genuine martyr he welcomed his death. Not only Khudiram himself became immortal, but he also inspired others by his sacrifice of life for the motheland, to become immortal. In course of time, thousands of young men and women followed in his footsteps.